The best parts of a vintage tweed Fender Champ are the vacuum tubes. State of the art technology when my Fender Champ amp was built in 1959, they were in every electronics device at the time. One of the coolest things about these big vacuum tubes is that you can see and feel them working. They glow. They get hot. They get REALLY hot. It is pretty common on these old Fender Champs to see that the power cord has been replaced. More often than not, it is because the power cord was wrapped up after use, tucked inside the cabinet, came in contact with the still hot tubes and melted through. Safety considerations of the time not being up to what we expect today, the tubes are mounted pointing down from the rear of the metal chassis and are completely exposed. There is plenty of clearance between the hot tubes and the wood of the cabinet on all but one side – the rear. Having hot vacuum tubes too close to nice and combustable pine wood panels could be quite problematic. So, what was the best material available at the time to deal with this issue? Asbestos of course! The video below gives a comprehensive overview of asbestos (minus all the health problems associated with it). It is called Asbestos – A Matter of Time. It was produced in 1959 by the US Bureau of Mines. I thought it was too sweet that it was made in the same year as my amp! From these videos, it looks like everything had asbestos in it at one point. So what does this have to do with my Fender Champ? 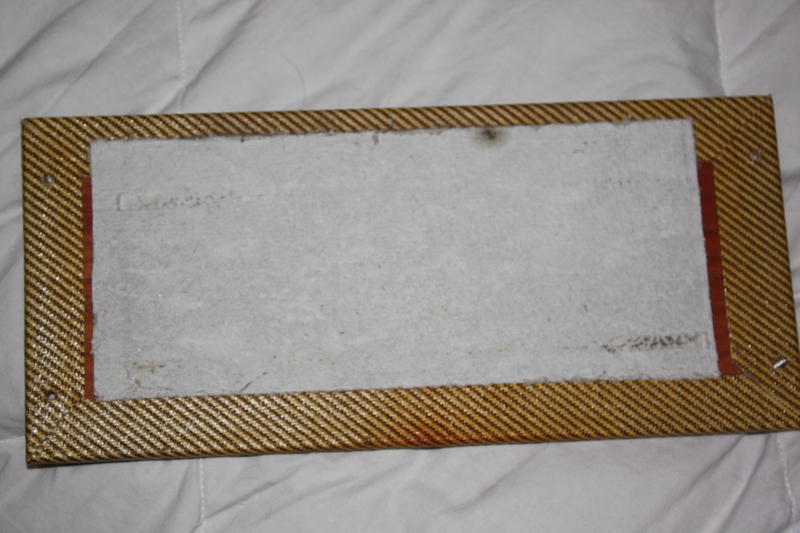 Asbestos fabric is what was used to keep the wood of rear panel from catching fire due to the heat of the tubes. You can see that on the inside of the rear panel there is a white, cottony cloth like material, about 1/16th of an inch thick, covering most of the panel. This is the side that is closest to the hot vacuum tubes and was most likely to catch fire if not adequately protected from the heat. Sometimes you will see scorching on this fabric , but it usually stays in pretty good condition. So, just how heat resistant is asbestos fabric? One more old time video clip demonstrates this quite dramatically. The clever wordplay is kind of cute.